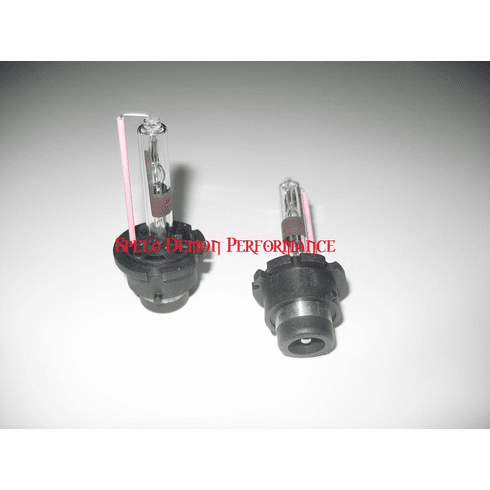 Xenon D2R HID replacement bulbs (2 bulbs) Choose your color! Home | Lighting: HID Bulbs and Halogen Bulbs | HID Bulbs | D2R HID (Xenon) Bulbs | Xenon D2R HID replacement bulbs (2 bulbs) Choose your color! <--- Check the color chart for approximate colors! Xenon's HID Replacement Bulbs are made from the best laser cut glass, are aligned with extreme accuracy and do not emit any ultra violet light that can damage the headlight housings or lenses. The gas mixtures made to fill these HID bulbs is very consistent and results in matching color between the pairs of bulbs so that one bulbs light output does not differ in color from the other. The high quality manufacturing and strict adherence to standards results in an accurate aim, consistent color and long lasting HID bulb. Bulbs are sold in sets of 2 bulbs. These D2R bulbs are a direct replacement for original equipment D2R bulbs. Warranty: 1 year for defects or failure. Replacement colors available: 4300K, 6000K, 10,000K, 15,000K, 30,000K and Purple.